Sophia Loren remained a bona fide international movie star throughout the 60s & 70s, making films in Hollywood and Italy starring opposite leading men such as Paul Newman, Marlon Brando, Gregory Peck, and Charlton Heston. Her American films included El Cid (1961), The Fall of the Roman Empire (1964), Arabesque (1966), Man of La Mancha (1972), and The Cassandra Crossing (1976). 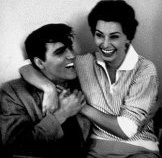 She gained a wider respect with her Italian films, especially Marriage Italian Style (1964) and A Special Day (1977). During these years she received a second Oscar nomination and won five Golden Globe Awards. Returning to Italy to star in Two Women (1960). The film was a period piece about a woman living in war-torn Italy who is raped while trying to protect her young daughter. Originally cast as the more glamorous child, Sophia fought against type and was re-cast as the mother, evidencing a lack of vanity and proving herself as a genuine actress. This performance received international acclaim and won her an Academy Award for Best Actress.